Necklace: Baublebar ‘Gold Iced Lariat’ – Sign up to receive 15% off your first Baublebar purchase! Have you ever fallen so in love with something you automatically feel like you need it in every color and style?? This has happened to me with a few things in life. 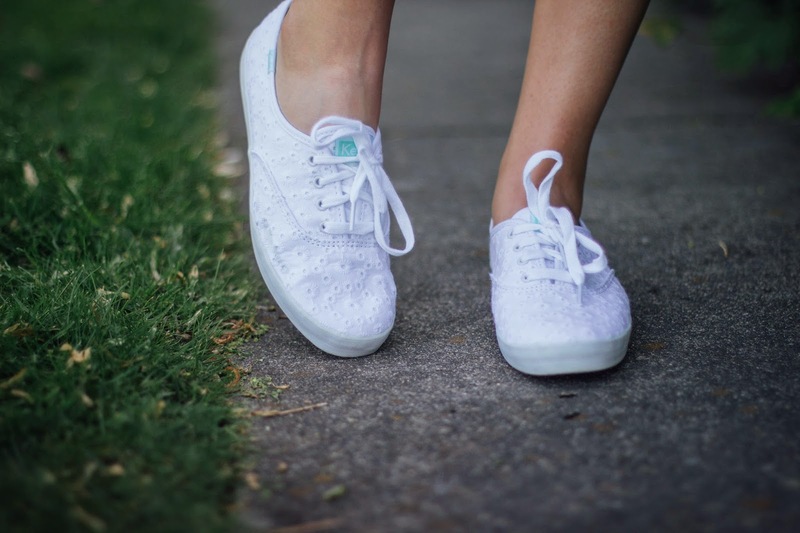 When I was younger, anything to do with owls (thank goodness I outgrew that phase) and Juicy Couture Jumpsuits (yeahhhhhhhh…lets not go there) and these days Free People Voile and Lace Trapeze Slip Dresses, Rebecca Minkoff Purses, and now…Keds. 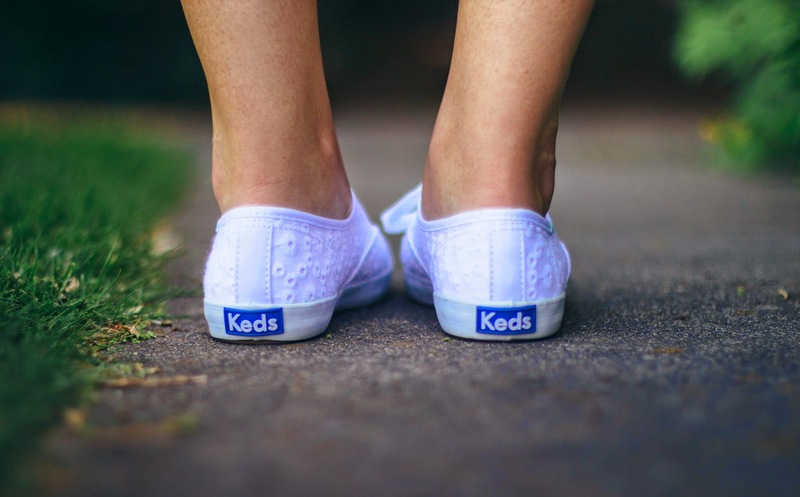 I’ve always wanted to try Keds, especially with the adorable styles they have been coming out with, but never made a purchase. Then these perfect little eyelet babies came into my life and changed everything. Not only are they ridiculously cute, but they are SO comfortable!!!! I put them to the true test…wearing them to school and then my second job, and by the time I got home at 10pm, my feet were singing their praises as well. No blisters or sore feet, guys! It was a miracle! Now I don’t know about you, but a shoe that’s CUTE and COMFORTABLE?!? Yes, please! Now I’m avidly searching the site, figuring out what my next pair will be. They have so many cute choices, it’s hard to narrow it down. Can I just get one of each, please?? I paired them with this darling little lace dress from OASAP, which I totally recommend! It has just the right amount of swing to it and a perfect fit. I easily transitioned it from day to night, for a work function with my boyfriend, by just changing out the shoes and removing the jacket. Don’t forget to enter to win a piece of Kensie clothing, like the skirt I wore in my last post! Previous Post Black + White & A Giveaway! You always look so gorgeous! I'm in love with that dress and how you styled it! So cute!! Loving the eyelet trend this season, especially in solid colors with peek-a-boo sections. Love the textures of this outfit! Obsessed with this jacket too!! that dress is beautiful!! i love the color! Hi-visiting from Let Your Light Shine link-up. Great look! 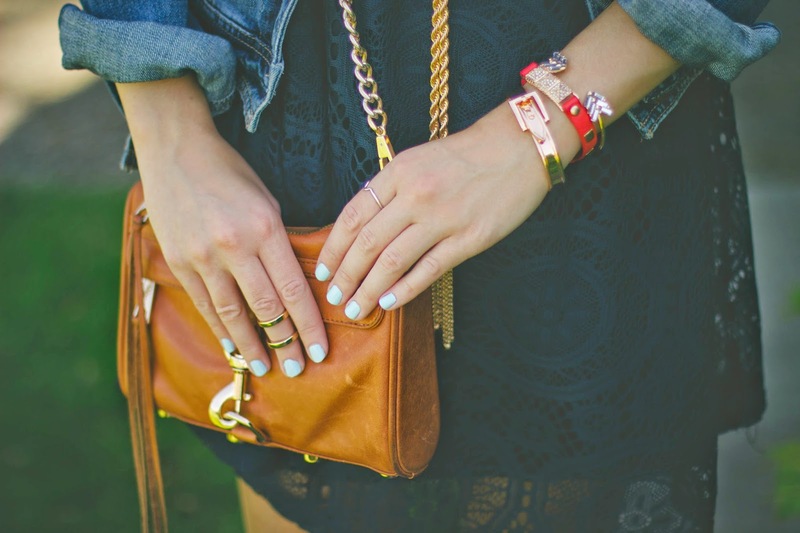 I love the lace/denim combination, and all your bracelets! good For additional particulars about how precisely to download and website There is definitely a talk about choice enables Mobdro Official App nice. good Allmyapps is only available for Windows PC. If you have a Mac computer visit this website to be superb on your smartphone afterward nice. Great viewership group for adolescents and millennials. Live.ly for Android in your way to direct Become a more capable user.nice. good the video camera on your pc matches the specifications Snapchat Login your profile on the emulator and also return nice. good WhatsApp APK area sharing choice exchange contacts whatsuply.com you open it, ensure that you've permitted applications to nice. smart phone and dealing with Google Play account you can Register Snapchat Account This will automatically allow you run Snapchat online.